Growing up in Arizona, Dash Cooper didn’t understand why the neighbor kids were so hesitant to visit. “At a really young age, I learned that the image everybody sees is the shock rocker he is on stage,” says Cooper, about his father, Alice Cooper. I spoke with Dash while he was on tour with his band CO-OP. What kind of sound were you going for with this album? DC: We went with the classic rock roots with heavy, modern overtones. So we’ve got the classic rock kind of rhythm section and we’ve got the really heavy modern guitar tones on it with heavy gravel vocals. I think it’s a good blend. DC: The whole band produced it, but it was recorded over at Full Well Recording Studio. They’re located in Phoenix. Mike Bolenbach was instrumental in helping us with the record. We didn’t have an actual producer though. How is it to be working with David Ellefson at EMP? DC: David has been nothing but exceptional. I’m very happy that we’re part of EMP. When did you form CO-OP? I read you went to ASU? DC: I graduated with a Bachelor’s Degree in Communications from Arizona State University. I started CO-OP after college. 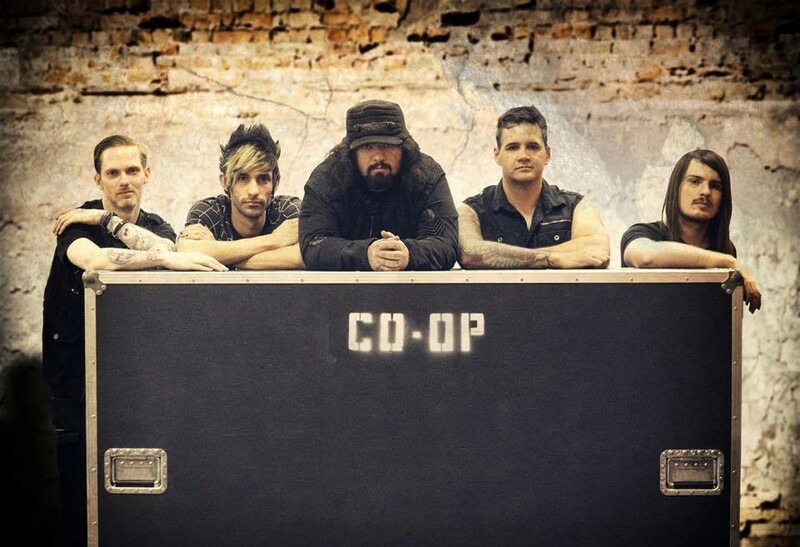 CO-OP—which also includes vocalist Cooper, lead guitarist Court Stumpf, drummer Mark Savale, bassist Justin Swartzentruber and guitarist Kolby Peoples—have been making a name throughout Arizona for years. Cooper says the EP took a little longer than anticipated to hit the stores. Life’s events—babies, jobs, etc.—took precedence. The band considers itself “desert hard rock” that considers the musicians’ different tastes. Stumpf prefers industrial music by the likes of Nitzer Ebb and Skinny Puppy, while Cooper follows Bullet for My Valentine. In addition to performing alongside artists including Korn, Motley Crue, Alice Cooper, KISS, Trivium, Steel Panther, Rob Halford, Slaughter, Jackyl, LA GUNS, Night Ranger, Johnny Lang, Beasto Blanco, P.O.D., The Iron Maidens, Lita Ford, Rob Zombie, Robbie Krieger of The Doors, Max Cavalera, Dee Snider of Twisted Sister, Ted Nugent, Orianthi, Roger Clyne and the Peacemakers, Great White, and tons more, 2017 brought the band on their first tour with One Eyed Doll, and labelmates Doll Skin.